One of the benefits of the Centers for Agricultural Safety and Health is a network of professionals across the United States. UMASH is fortunate to work with a number of centers, faculty, and staff to share agricultural safety and health resources. Researchers from two of the US Ag Centers have taken a new approach to dairy safety training, incorporating mobile learning technology into their program. Dr. David Douphrate, Associate Professor, and Anabel Rodriquez, Graduate Research Assistant, brought the training to the field/barn on iPad devices. The curriculum for this unique approach to dairy safety training included the 5-part positive animal handling video series created by UMASH. 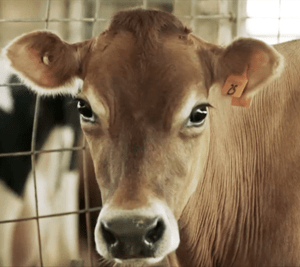 Read on to learn more about this successful training method for dairy farms and workers. We trained over 2,000 dairy workers in the United States using short video vignettes on iPad devices. Between 2015 and 2017, we visited 59 dairy farms in Texas, New Mexico, Colorado, Kansas, New York, Idaho, and Washington with funding from the Department of Labor, OSHA Susan Harwood Training Grant Program. Effective worker safety training is one way to facilitate the reduction of safety incidents. Safety training is necessary to inform workers of hazards and equip them with knowledge and resources to protect themselves and coworkers. Safety training can be diverse in delivery. Technological advances called for a modern delivery method—mobile learning (m-learning). M-learning refers to the use of mobile or wireless devices for the purposes of learning. Considering all challenges on a dairy, including remoteness and limited internet connectivity, we created a downloadable internet-free training program in both English and Spanish. Technological advances called for a modern delivery method—mobile learning (m-learning). The first two years, we delivered a general safety training. 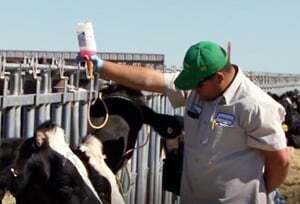 The series of videos were created by New Mexico State University Dairy Extension. The first part of the training focused on overall farm safety; whereas, the second part of the training sectioned off into either milking parlor safety, feeding safety, or general worker safety. Workers had the option to select whichever section aligned with their daily work duties. Before video training, workers took a 15-question pre-test and after the training took a 15-question post-test. The first two years, pre-test average was 74.2% and the post-test average was 92.4%. The third year, we delivered an animal handling training with a live-demonstration component. Part one of the training retained the NMSU overall farm safety videos. Part two utilized the Upper Midwest Agricultural Safety and Health Center (UMASH) five-part video series on dairy stockmanship featuring: (1) animal behavior, (2) cattle senses, (3) pressure zones, (4) effective cattle handling, and (5) milking parlor practices. Similarly, workers took pre- and post-tests concerning training material. The pre-test average was 63.8% and the post-test average was 89.5%. After the training, workers were taken outside to a pen to practice moving cattle in a safe and calm manner. Dr. Robert Hagevoort, NMSU Dairy Extension Specialist, led live-demonstrations in both English and Spanish. All workers received a certificate with their names printed on them. Overall, the goal of these trainings were to develop, deliver, and evaluate the m-learning approach to deliver safety awareness training content to U.S. dairy workers. The training proved to be an effective way of delivering safety content. It was received well by both workers and producers. I just want to commend you on the fantastic video and coordination of training to get all of our employees the certification. It is a wonderful program and was well received by everyone. The improvement on test scores really shows they were paying attention and that they learned from the video. It takes a heck of an effort to train that many people in a 24 hr environment. Thanks for working with the shift schedules and the two locations. We plan to keep up the training with all new employees. Thank you for coming all the way to New York to provide the training. I hope you enjoyed your time in upstate New York and your time in NYC. The feedback I got was very positive. They really like the format and the ease of using the iPad to do the training. The feedback I got from the management team is that it is a good tool for new hire training and refresher training. They would love to see the same training format with more specific modules like the Feeder, module that would cover even more depth of information. Dr. David Douphrate, PhD is an Associate Professor in the Department of Epidemiology, Human Genetics and Environmental Sciences at The University of Texas Health Science Center at Houston. 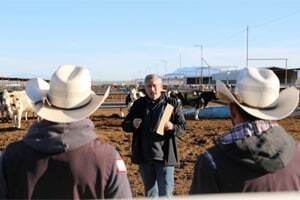 He currently has funded projects in dairy from the High Plains Intermountain Center for Agricultural Health and Safety (HICAHS), and a logging project from the Southwest Center for Agricultural Health, Injury Prevention, and Education (SWAG). Anabel Rodriguez is a Graduate Research Assistant at The University of Texas Health Science Center at Houston. Safe animal handling is important for both animal and worker safety. It reduces stress, increasing milk production and reducing potential injuries on the farm. UMASH has developed a variety of educational and employee training resources on safe animal handling practices (available in English and Spanish).